Give this colorful table and chair set to your kids to use for a variety of activities. Constructed from steel for extreme durability, this Cosco five-piece folding chair and table set can withstand the natural playtime of kids over many years. Quick and easy to assemble, simply screw the legs into the top and you instantly have a place to play games, do homework or have an afternoon snack. 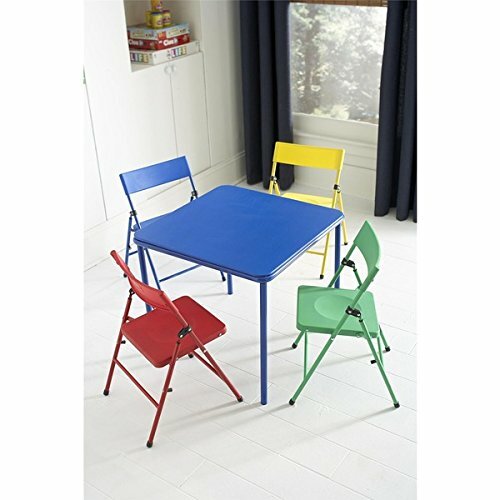 Brighten up a playroom with the bold primary colors featured on this table set, that can also be used as an aid in teaching your kids about color in a fun way. The steel powder-coat on the frame prevents rust from forming and is easy to clean.